Invisalign Near Allentown: How Do Clear Aligners Work? Does the alignment of your teeth often cause you to feel insecure when speaking or smiling? If so, you have probably considered orthodontics in the past, but you do not want to deal with the appearance and restrictions of metal wires and brackets. Not to mention, metal braces are often viewed as being only for children, so you have made the choice to live with the imperfections. What if you could get the straight smile that you have always wanted with a nearly invisible solution? Now you can with Invisalign near Allentown. While you have heard about the benefits of the clear aligners, you may be a bit skeptical about how they work. Rest assured, you will achieve lasting results to invest in your confidence. It is estimated that only 35% of adults have well-aligned front teeth. In the past, most adults choose to live with the flaws; however, due to advancements in orthodontics, 1 in 5 patients are now over the age of 18. The most preferred solution for older generations involves the use of Invisalign. It is uses a series of clear custom-made aligners that are worn over the teeth to gradually move them into position. Although no wires or brackets are used, they are effective for correcting an array of bite and alignment concerns. After an initial consultation to ensure that you are a candidate for the treatment, 3D impressions are used to create a “road map” to move your teeth. With this technology, you will even be able to see what your new smile will look like before you commit to the treatment. 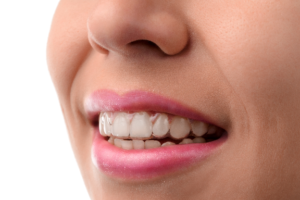 Using the impressions, a series of aligners are developed to be worn over your teeth. You will wear each one for about a week before switching to the next. On average, it will take about a year to finish your treatment. At the end, you will briefly require a retainer to prevent them from moving back into their previous positions. Although metal wires and brackets are not used to move your teeth, the aligners are effective by providing constant pressure. As you progress through your series, your teeth are gradually moved into their ideal positions. Do not worry, there is only minor tenderness for a couple of days after moving on to a new aligner despite the pressure. Get a New Smile Today! If you are tired of hiding your teeth due to alignment concerns, it is time to invest in your confidence with Invisalign. With the clear aligners, you will start your journey to a straight smile without the appearance or restrictions of wires and bracket. See if Invisalign is the right choice for you by scheduling a consultation with your dentist. Dr. S. John Salivonchik is a noted dentist in the community due to his exceptional qualifications and training. Supported by various dental organizations and associations, including the American Dental Association, he provides individualized solutions to improve the appearance and health of the teeth. If you are interested in correcting the alignment of your smile, contact our office today to schedule a consultation. Comments Off on Invisalign Near Allentown: How Do Clear Aligners Work?